To better understand the state of IT in healthcare, Express Computer partnered with The Hospital Information Technology Association (HIT) and organised HITS 2018, as a part of Healthcare Senate 2018. The gathering brought together key stakeholders such as hospital CIOs; and major IT companies discussed a new buzzword – Healthcare IT. HITS 2018 featured some of the industry’s most recognised leaders, who shared their insights into current technology innovations and shared their perspectives on how digital is changing the game for the healthcare industry. The two-day event discussed various topics, real-world use cases with industry focused tracks and panel discussions. Srikanth RP, Editor, Express Computer magazine, talked about the rapid adoption of electronic records in hospitals, embedded medical devices, analytics and the growing use of wearables; and how these technologies are rapidly transforming the way healthcare services are delivered to tech-savvy patients. Sumit Puri, CIO, Max Healthcare, in his keynote address, presented how Max Hospitals are using technologies that are helping to improve patient care. He also spoke about the dilemmas that CIOs and IT Heads face at the hospital and how hospitals can achieve the goals of better patient care through consolidated IT platforms, leveraging predictive clinical analytics to improve patient safety, and using operational analytics to enable realtime dashboards for improving patient admission and discharge turnaround times to enhance patients’ convenience. An interesting panel comprising veterans from the healthcare sector deliberated on the roadmap of digital transformation and existing challenges like low adoption of electronic medical records, adoption models. The panel also talked about smart solutions to perennial problems. The panel included Vivek Sahi, Board Member, HIMSS APAC India Chapter; Partha Dey, Member, HIMSS India chapter and Girish Koppar, Sr Manager – IT, Lilavati Hospital and Research Centre. This panel discussion was moderated by Ishaq Quadri, Secretary and Board Member, HIMSS APAC India chapter. While all panelists agreed that there is potential in the Indian healthcare market for technology players, they also pointed out the difficulties of this market in terms of implementation and translating the IT investment into RoI and Opex vs Capex model. One of the focused sessions was ‘Healthcare in India – Five years from now: A CIO perspective’. The panel discussion was moderated by Raghuram Janapareddy, Director – Open Innovation, Nasscom Centre of Excellence for IoT, India. Vishal Gupta, Head – IT, Indraprastha Apollo Hospitals; Alok Khare, VP – IT, Jaypee Hospitals; Sayed Kadam Murshed, Head – IT, Medica Hospital and Sudip Roy, Group CIO/Advisor, AMRI hospital, shared their inputs on a variety of topics, from Ayushman Bharat to telemedicine implementation and interaoperability issues. The session was well appreciated and highlighted the key challenges CIOs are facing with respect to IT implementation, compliance and improving clinical outcomes through digital transformation. The second day of HITS started off with a Hitachi Vantara and NxtGen joint power discussion – a closed door meeting with selected CIOs. Sanjay Agrawal, Director, Pre-sales, India, Hitachi Vantara and Abhishek Dey, Senior Pre-sales Consultant, Hitachi Vantara talked about digital transformation in healthcare and how cloud will be a gamechanger for the healthcare segment. The discussion was centered on sharing and storing of data between multiple hospitals through Vendor Neutral Archive (VNA). Agrawal mentioned that Hitachi Vantara is working closely with the state government for bringing multiple hospitals’ data on a central location for quick delivery of services. NxtGen gave an overview of Patient 360 Degree View as a service and showcased Cloud Nine case study to CIOs. In a joint presentation by the founding members of HITS association, Girish Koppar, Ishaq Quadri and Sumit Singh, spoke about the formation of HITS and how it has been expanding beyond metros. The HITS presentation was followed by two vendor sessions. 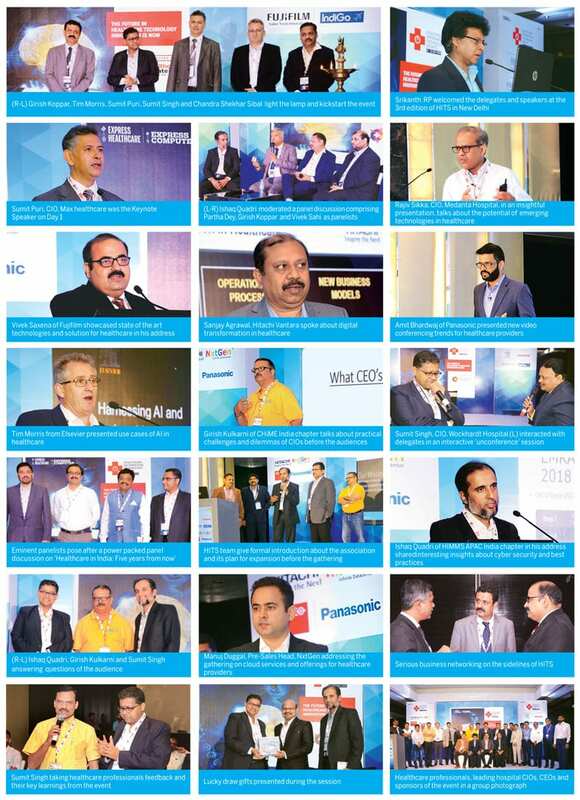 The first was conducted by Hitachi Vantara and its team and the second session was done by Amit Bhardwaj, Regional Manager – Sales, North India, Panasonic, who demonstrated Panasonic’s latest offerings for the healthcare segment. Girish Kulkarni, Chairperson, CHiME, India Chapter, made a simple yet powerful presentation based on what CEOs expect from CIOs. His session described how challenging is the CIO’s role, being a healthcare professional. He shared do’s and don’ts for CIOs. The session touched upon the day-to-day issues that CIOs face at work and put across some of the best practices as well. Another interesting session was conducted by Tim Morris, Product and Partnership Director, EMEALAAP, Elsevier, who spoke on the topic of ‘Improving clinical outcomes through Artificial Intelligence’. He also shedded light on the projects he is working on and how they are useful in prevention of diseases. According to him, the real problem needs to be curtailed using the right technology. He also highlighted that the healthcare industry, as much as any other, needs to be protected by robust cybersecurity systems, not just because they could face audits or fines; there is much more at stake. “Security teams at hospitals must look beyond bits-and-pieces software solutions and adopt a detailed, uncompromising approach towards cybersecurity, with help from external experts if need be,” he said. The event concluded on a positive note and affirmed that IT in healthcare will witness a complete spectrum of the healthcare ecosystem, wherein small clinics will co-exist with home healthcare and large, sophisticated hospitals. The trend is pointing towards more and more homecare, ambulatory and emergency care services outside of hospitals. The focus is also shifting towards a preventive approach from a curative approach. Personal IoT-based health monitoring devices will change the way we track the health of individuals. Technologies like Blockchain will soon redefine how we populate and maintain EHRs, and how we link them to other services like payments and insurance, among others. AI will increasingly assist physicians, health workers and care providers in triage, diagnosis and treatment.